Five more gorgeous Goddesses leap into the foray! Wartune is an ARPG browser game that has celebrated its 6th anniversary this year. Wartune is now ready to launch its Goddesses update of 2018, version Wartune 8.1. According to the official information, this version will bring in 5 new Goddesses into the Wartune world to help warriors fight against demons. Also, new battle dungeons and several events will be released. Read the following review of Wartune 8.1 below. Wartune 8.1 brings the new Goddess System. There are five Goddesses in total with different dynamic skills and blessing skills. To summon the Goddesses, find the Shards in the events and challenge the Demon Continent. 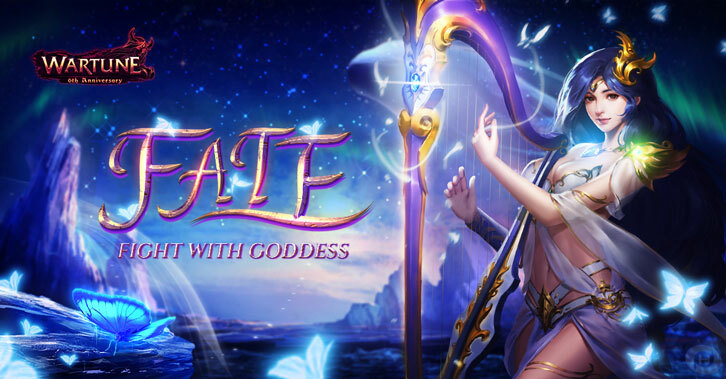 Fight beside the Goddesses in an epic battle for honor and glory. The Demon Continent is a dangerous place. It has the beautiful Murmur Coast and also the Duskin Arena. The dark magic of this place has put the Goddesses in danger, you must complete the challenges in the Demon Continent and save the Goddesses! Collect enough Goddess Shards to summon all the Goddesses. In this strange land, players will also find Wave Crystals and Prayer Scripts to upgrade the Goddess’s skills. As September comes and Autumn is here, it’s time for the harvest! Join the Cornucopia event in Wartune and blow the horn. Collect five items to active the Cornucopia. And win a Cornucopia Pack filled with rewards that will be shared between all the participants. Free rewards will appear from time to time in Wartune! Join the Golden Ram Event and catch the Golden Ram! When the Ram it’s about the appear players will receive a message in the chat system. Try to find it to win rewards! The Goddess system is one of the biggest updates Wartune has prepared this year. How do the Goddesses look like? What will be their role in the battle? Will it bring a different experience for players?